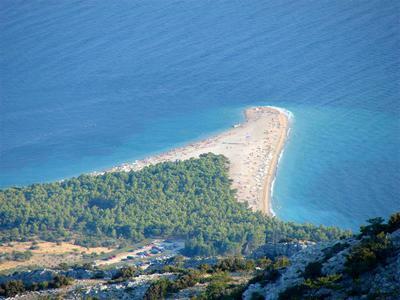 Among all of Brac Island's beaches, the most striking is undeniably Golden Cape Beach (Zlatni Rat). Situated in Bol, a town on Brac Island, Croatia, this white pebble beach is one of the most fascinating in Croatia, if not the entire globe. This 530 meter (580 yards) beach stretches out, just in front of Bol, like a white tongue into the sea. It changes shape and position according to weather and tides, so is never exactly the same beach from one visit to the next. Few people know Croatia well, let alone that it has world-class beaches. 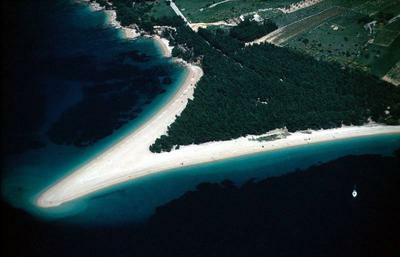 Of them all, Golden Cape Beach is the most visited beach on Brac island, which says quite a bit since Brac has other beautiful strands of sand. The scenery is simply sublime, with Vidova Gore mountain towering over the beach. The blues of clear sea water that surround "the tongue" vary according to the light, as you can see in the photos. And the sounds of the waves on the white pebbles, caressed by the gentle breeze are quite unique. You can hike up the mountain for a most magnificent view and photo opportunity. Then come back down and cool off in the clear, comfortable waters. Golden Cape Beach is one of the world's truly great, unknown beaches. I hope you get a chance to experience it. If you have been here, please comment on this page. I would enjoy reading about your experiences at our special place.